Is there a way to get this running using Qemu[Q for OS X]. I've compiled Bochs under OS X but I can't because of a "bus Error" in Bochs under OS X.
i'm trying to boot this on a thinkpad t42 (not in an emulator) from grub (chainloder –force +1) and all i can get is an error message that says 'PCI parity error on bus/device/function 00F0h". oh, by the way, i've compiled bochs on linux with cirrus support, but there's a strange and rather annoying bug which is exclusive to the linux version: anytime i press shift, it messes up the terminal and from then on everything is upper case. even mouseclicks don't work in X. it's like if the shift key is 'stuck'. did you have this problem? anyway, thanks for sharing this, i'll try to get around the bugs and see if i can get networking running. It stemmed from the modules, eth0, and X11… Things I just can't stand…. Oh and all the libc's! hey, thanks for responding. i know what you mean, linux sucked royally before 2003-4. i'm not a linux advocate or anything, but if you're willing to try again, nowadays is probably a good time. anyway, i've fixed the issue, so to anyone having weird keyboard problems: turn off any keyboard mapping customisations and switch the layout to us. then it'll work fine. getting networking is really a pain, especially in bochs. i'm trying to get it working under qemu, i'll report back here. 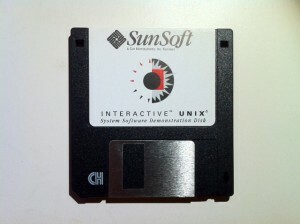 If anybody else is searching, I have a complete set of disks and manuals for Interactive Unix stashed away in a closet. @Deathgrip: which version? are they still working? are you willing to dd+scan them? or maybe sell the whole set? @neozeed: could you please reupload this? i’ve fscked up the boot image beyond fsck (pun intended) and don’t have the original zip. I’d second bamdad. Can you please reupload this? I missed the time to download this one. Please, please, pretty please! With cherry on top! check it now.. must have gotten misplaced in the great shuffle. Is there any chance that you could upload the installation media as well? Unfortunately, I am not in possession of those, Tenox is. Thanks for sharing this. 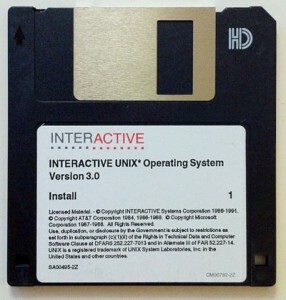 I used Interactive UNIX in the early 1990s when dozens of us in my area set up a UUCP calling tree to exchange mail and Netnews with the rest of the world. We had a mix of Amigas, AT&T UNIX PCs (7300/3B1), and Intel boxes (mostly i386s, though I think the rich guys had i486s) running Interactive, all calling each other hourly. I picked up my copy of Interactive at Weird Stuff Warehouse in the Bay Area. All the white boxes filled my shopping cart. Shortly thereafter, Linux grew up enough to use and I switched to that and have been running it ever since. Still, it’s good to see Interactive preserved and not forgotten. It has a place in the history of UNIX on desktop hardware. BTW what version of Interactive Unix did you pick there? 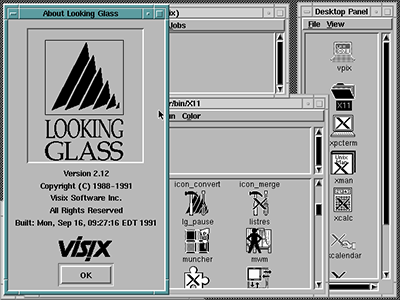 I’m looking for 4.1 Workstation which included the Looking Glass environment. Any word about the installation media? 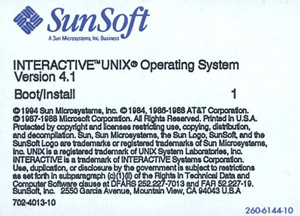 Interactive Unix is getting rarer and rarer! im like a kid with candy ! I should probably find a ‘random’ button so you can jump to random pages.. Hopefully I’ve got tonnes of stuff on here by now…! No reply? At least you can borrow the installation media from Tenox, image it to the website and give it back to him. I was hoping he’d reply I don’t have access to any of the install stuff… or ask him, he isn’t that hard to find. Executing ./xdm acts like hiccups: it changes resolutions and then gets me back to the command line. Maybe you could help me out with the issue? If you want the image installed in bochs, please tell me so I can upload it. maybe theres someone with experience. Sounds like reminiscence of LILO in the MBR. Try to boot with MS-DOS bootable disk and run fdisk /mbr. that i have already done, but then there appears the dos message that theres no operating system present. is there a possibility to copy mbr from another disk to the new , because i have an existing disc which boots to interactive,but stops then with fsck – without possibility to cancel fsck. if you are interested – i copied mbr from old disc and put it on new disk. system now working – its still a productive system. I’ve got a set of 30 original floppy disks (3.5”) with version 4.1. I tried several times over the last couple of years to get it running in a VM (VMWare or VirtualBox), but always failed. Has anybody succeeded in doing this? try qemu, it has a lot more options when it comes to legacy emulation. maybe even bochs, if it can run aix, it should be able to run ineractive unix as well. I don’t think I ever got it up on VMware. VirtualBox may be easier. I would suggest to contact Michal Necasek of os2museum. He has a high success rate of patching things to run in Vbox. How to convert teledisk to somethign readable by virtualbox or qemu? please,how to install on qemu? I have found a method to avoid ide bug,is simple..using scsi controller! I tried to install interactive unix in virtualbox from the 4.1.1 media that I still have in a long forgotten box. I imaged the floppies to disk and used them from there. Unfortunately I do not have the looking glass version either. Just the basic with networking included. I could install interactive using the buslogic drivers, but then after the installation is complete and I reboot I get a message “Missing operating system”.  Does anybody know from where this error message comes ? When I then attempt to install again the interactive unix installer will the the previously installed disk in the virtual machine and offer to do an update. So I think the installation worked successfully and it is just a matter of getting it to boot. If I had to bet, your hard disk may be too big. I tried images of size 2048mb and 1024mb with the buslogic and the aha-154x drivers. Better with 512mb sized images ? There is nothing specifying a size limit, it even talks about disks larger than 1024mb in these manuals. I’d try something under 500MB.. Plenty of older stuff typically have limits around the drives of the era, and were pretty silent about it, and nobody noticed as getting a 1GB or 2GB disk was something that would have been either far too big, or expensive if it even existed. Or that’s been my experience with PC UNIX, the filesystem may technically go to 2GB with FFS/UFS but the older filesystems were maxed in far smaller spaces. Xenix being particularly picky about needing to live in under 500MB for the boot loader to install correctly as well. You may have to use MS-DOS 5 to put a MBR on the disk as well. I vaguely recall not everything would put one on the disk if it were zeroized. However I can mount partitions from the bigger disks as a second drive when I boot from the 512MB disk. The partitioning program on 4.1.1 offers to fix the mbr. I did not need to copy a MSDOS mbr. raganata reported on November 22, 2014 at 8:32 am in this instructions above that he used a 900mb disk. I wonder if not the disk size is the problem, but the partition size of the root partition. I am still looking for installation media of 4.1.1 ius with the graphical environment since I only have the network edition of it. And I am willing to share my floppy disk images of the network edition of ius 4.1.1 if anybody is interested. scammer picture link? malicious ragazzakatana? Just the inevitable death of content. It was used by the US Army as the base operating system for the Standard Army Retail Supply System-1 (SARSS-1) back in 1992. It was available as part of the Small Multipurpose Computer contract. Use mkpart to write the boot sector. I have several disks with ISC 4.1.1 and maybe the installation media as well if you still need it. if you still got installation media or an installed version of 4.1.1 with the graphical environment that would be swell. I have submitted a version of 4.1.1 with networking, but without graphical environment to vetusware and it is also on winworldpc now. The networking version of IUS 4.1.1 works in virtualbox with the adaptec scsi disk driver and the amd lance net device. Nice article! I wrote it several times and tested the bochs image. Works fine. Anyone: sources for install media containing the X11 Window System for INTERACTIVE consisting of the following floppy disk sets?